Honestly, San Sebastian is so beautiful you may decide that you want to spend the whole month…but then you’d never get to see the huge puppy topiary in Bilbao. I bought Keens áfter my first Camino. Love them. I’m happy it’s such a relaxed experience for you this time. I experienced such joy when I found myself on the Camino a second time, without pain, that I couldn’t stop myself from practically jogging some of the time. Got some strange looks from some folks I passed. It was so much easier to get the right pace. There was time to stop and take in new things I missed the first time. And I managed to shave of more than a kilogram by leaving things behind I knew I didn’t need second time around. Thanks for sharing about your joy the second time on the Camino. I have worried (just the tiniest bit) about being letdown the second time around because the first time was so amazing. Happy Easter! Hi Elissa, nice to meet you. I went over to your blog and signed up straight away. Buen camino! Well, I don’t know that I’ll be jogging parts of the Camino this time around (see my post today…) But then again, I tend to get overly anxious about certain things when I’m in the preparation stage. This year, I’m relaxed about the gear, about the travel and the logistics… but as ever I’m worried about my physical preparation! Me! That was me who said that. Well, it could have also been someone else, LOL. But one of the things I realized only after walking the Camino for the first time was how precious that time leading up to the first Camino was and I sometimes wish that I had journaled more than I did during that time. On your “Round 2″ post on March 2nd, you wrote, “(we’re sort of having parallel experiences!! )” and I am definitely feeling it with this post! The prep this time around is completely different, as is the anticipation. 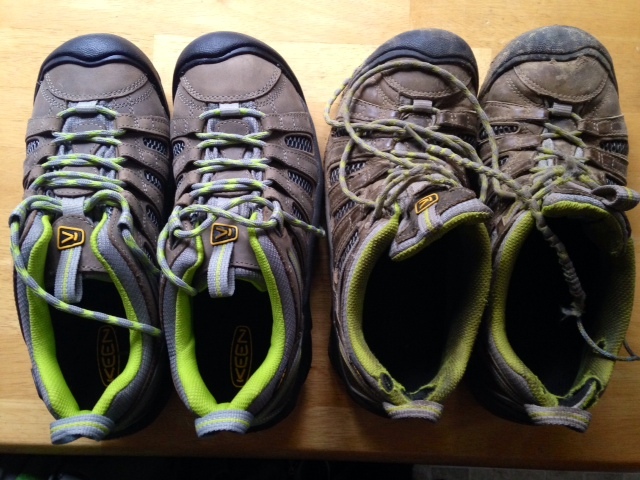 Two days ago, I ordered this year’s Camino shoes and, like yours, they are the exact same pair I wore last year. (I love the before and after shoe pic, of course.) And reading your post last year, “These Boots Are Made from Walking…Hopefully”, I have similar posts from last spring when apparently we were also having parallel experiences – just without knowing it! I’ll be starting my walk on the Norte mid/late June- how about you? I think that we were walking within a week of each other last year on the Frances, and it would be so great if we ran into each other this year!! Never underestimate Camino magic! I have a feeling from your blog that you’ve got the training part of the preparation better covered than I do this time around- the photos from your hikes are gorgeous!! I leave the U.S. on June 16th. It certainly would be something if we ran into each other! I’m not sure about the training; I feel like I haven’t done nearly enough…certainly not as much as I did for the Francés last year, lol. Thanks for checking out my hike photos! About those shoes….I have the same thing going with my 2nd pair of Merrels in 2 years, and I really hope they don’t discontinue the line. Perhaps we just need to buy a lifetime’s supply of shoes? 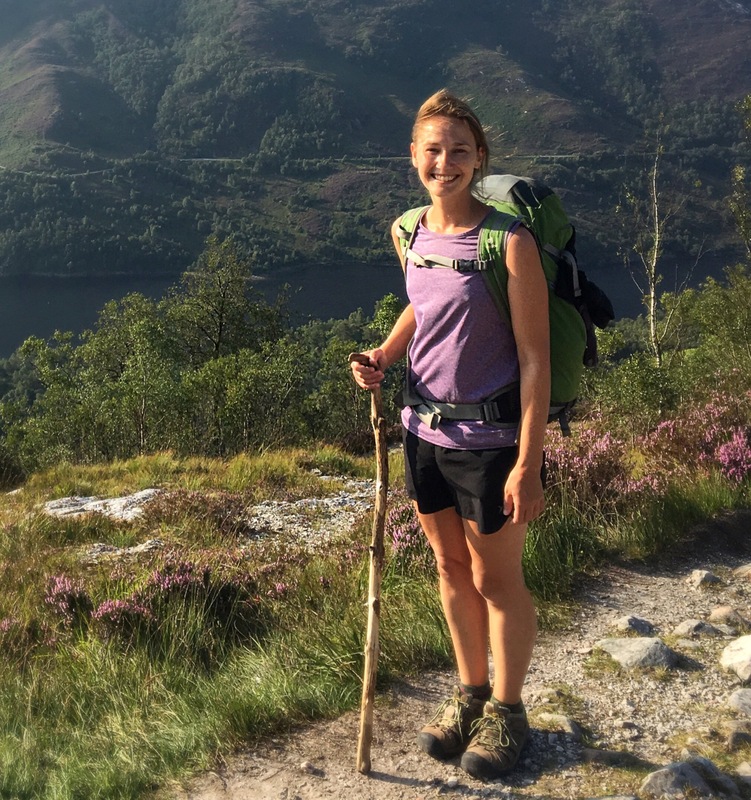 Hope your training (both physically, and also in terms of learning Spanish) is going well–and yes, I think the Camino does begin, in a way, with those practice hikes. Hi Nadine. Good luck on your Camino this year. I am still trying to determine why my feet hurt so much on my recently-completed Camino. One of my gym instructors thinks maybe some of the 152 muscles in each foot were not in good physical condition. Maybe the custom orthotics in my hiking shoes were too hard. I am already thinking about a 2017 CF, if my wife will let me go. I am pretty sure that the foot pain was self inflicted. I think the orthotics had a lot to do with my pain. Next time, I would take them, “just in case,” and look for some softer insoles. Also, I will look for a good pair of sandals that are not as heavy and bulky as the Tevas. I feel like I missed a lot, by moving too fast trying to meet a schedule to get back to the US before Linda left for Africa for a month. Next time, I know better what I want to see that I missed this year. Anyway, I did mention to our son, Colby, that I was thinking about a 2017 CF. He would do another increment with me, perhaps from Pamplona to as far as he could get in a week. I now know of about five women who want to walk the CF in 2017. Just not sure that Linda will be onboard with my walking with all these younger (and pretty) women. When you’re my age, all younger women are pretty. I will make sure that they subscribe to your blog, since it is so informative and well written. A couple of the gals are good bikers and a lot stronger than I am. Due to time constraints, they are considering biking the Camino. Not sure I would want to bike the CF except for the Meseta, perhaps. Maybe I can talk them into a hybrid Camino. Anyway, good luck on your Camino. I will take vicarious pleasure in following your footsteps.